No! No, master! Not clothes, not clothes! Yes, Poppy. You didn't think you'd get to hang around the house in a tea towel for the rest of your life. You remember clothes? Cute outfits? And don't think you're going to slouch out in those khakis. Unless you're planning to get decent shoes, which I know you're not. 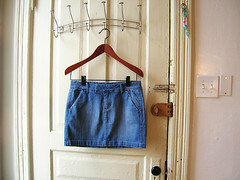 Oh my god, did you know these need to be shortened? The cuffs are just folded up. So I went out and got some new skirts. 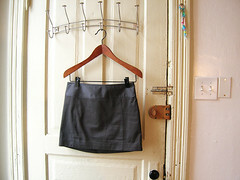 Every time I leave the house swearing to get knee length pencil skirts, and always come home with miniskirts. 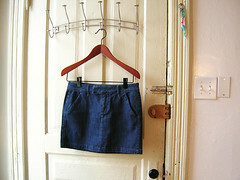 One of two cotton sateen miniskirts for Tuesdays, and one of two denim miniskirts for Thursdays. My winter work look is going to be sweater + miniskirt + leggings over tights + snowboots. Do you know the winter coat that I never wear is actually warm and I don't have to layer my clothes so much, who would have thought. Packing as much muscle for my height as I am, I don't want to add any more bulk. Leggings over tights is actually pretty warm, and still looks slim. You're worried about the snowboots, aren't you. Well.